We are engaged in providing a broad array of Thumb Screws to the patrons. Optimum quality raw material and latest equipment are used in the manufacturing process. We also offer customization of these products as per the specifications provided by our clients. Further, these products are checked on numerous parameters by our quality controllers before final shipment. Founded in the year 2003, Bhumi Brass & Alloy is a manufacturer, supplier and exporter of a comprehensive range of Brass Components and Allied Industrial Fittings. In our product range, we offer Brass Neutral links, Neutral Bars, Brass VRLA battery Inserts, Terminal Inserts, Earthing rod Clamp and U bolt clamp, Switchgear parts, Terminal assembly parts, Energy Meter parts Forged & Copper Anchor & Brass Nail Pin, Brass Knurled Anchor, Collar, Eyelets Nuts and Inferior & Superior Studs. 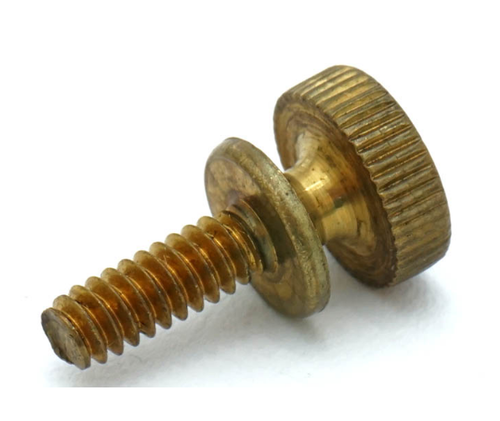 Furthermore, Electric Equipment, Brass Terminals, Brass Rivets, Brass Earth Terminal Socket, Brass Busbar and Plug Pins, Brass Screw and M S Screw, Brass Bolt Nut washer, Brass and CNC Machined components among others. Superior grade components offered by us are in compliance with the prevailing industry standards & norms, and find extensive usage in electrical industry and allied sectors. Our firm is known in markets across the Indian Subcontinent and Middle East for practicing fair business dealings and maintaining transparency. Owing to this, we have managed to establish a strong foothold in the industry. Supported by a widespread distribution network, we are able to ensure prompt delivery of consignments at clients' end.